South Korean hypermarket chain E-mart unveiled Tuesday its plans to make a film based on its mascot Electro Man. Electro Man, a mascot for E-mart’s electronics store chain Electro Mart, will be featured as the main character in the film slated for release in 2020. The announcement came after overall sales of Electro Man-inspired products including an air fryer rose over 300 percent on-year in the first half of 2018. The film is part of the retailer’s efforts to attract more customers by using soft power strategies with the character, while fending off competition. As Electro Man has proven popular among customers, the character will bring in revenue in the form of toys and clothes, according to E-mart. The retail giant also said it plans to establish a private company dedicated to harnessing investment, production and distribution of the film, adding that it would be shut down after the film’s release. The superhero first appeared in June 2015 at Electro Mart in E-mart Town in Ilsan, Gyeonggi Province. 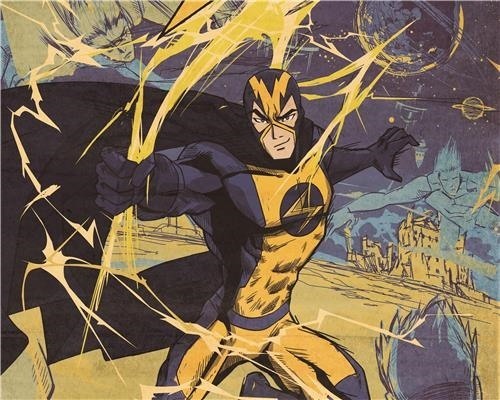 Later that year, Electro Man was also featured in a web cartoon series in which the character fought villains to protect a source of life on Earth.